Double-sided tape is a revolutionary adhesive product that’s cleaner and tidier than glue. It looks like your average roll of sellotape, but instead of one smooth side, both sides are sticky. To use double-sided tape, you apply one side onto the material you are working with, then peel the backing layer off. You then apply the item to the content to seal it in place. Some double-sided tape rolls are better than others, so read the product information below to see if you can find the best adhesive tape for you. It can be hard during home renovations to find products such as double-sided tape that won’t let you down. Typically when you see something that says it sticks well, it doesn’t. That’s where Double Bond differs. Their roll of double-sided tape is exceptionally sticky and is suitable for both home and commercial use. It doesn’t get much better than that. The roll is two inches wide and 30 yards long, which is ample for most household renovation requirements. If that’s not enough, you can also choose to buy it in packs of three. When it comes time to stick carpet down, this double-sided tape is in a league of its own. It’s that tacky and sticky that you may even have trouble unpeeling the roll. Therefore, you know that when you stick it down, it’s not going anywhere. This tape is a professional grade, uses hotmelt adhesives, and works on most surfaces. It will even conform to shapes that may not be easy to manage. Use it in business, at home, and enjoy how it sticks surfaces down quickly. It doesn’t work for all materials and doesn’t stick to brass, but it’s an excellent option for almost anything else. Even though you wouldn’t use this double-sided tape for intense DIY work or textured materials, you will find it’s all you require for home crafts and school projects. It’s sticky, affordable, and comes in a pack of six for your convenience, but that’s not all you will appreciate. 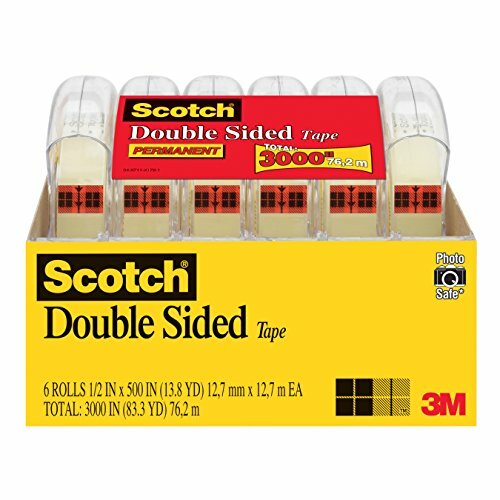 This photo-safe double-sided tape comes in half-inch rolls with 500 inches of sticky tape on each roll. It also comes with a dispenser so you can save your hands from fumbling around. The serrated edge for tape cutting is convenient, but it’s too dull. You may find it’s quicker to use scissors. What people appreciate when using this double-sided tape is that it’s suitable for most crafts. You don’t have to mess around with glue and messy adhesives. Instead, you peel off the tape, stick it to your art, then peel off the second side. It won’t damage photos or anything else you need to stick down. 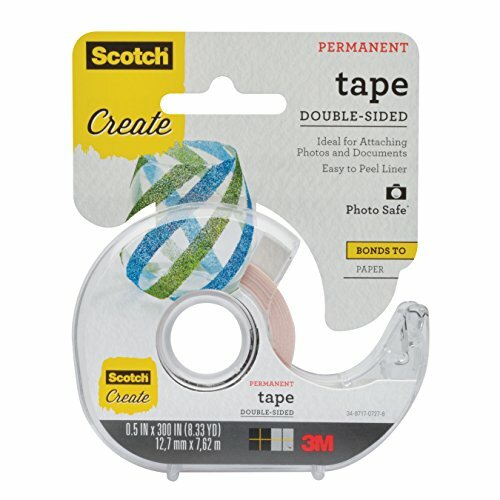 It’s not overly suitable for rippled surfaces or hot environments, but there are very few scenarios where you won’t appreciate this tape from Scotch. If standard adhesive methods have failed for your project so far, then it could be time to reach for the double-sided tape from Gorilla. Made of tough stuff and suitable for a whole host of materials, it could be the answer to helping something stick to a surface. 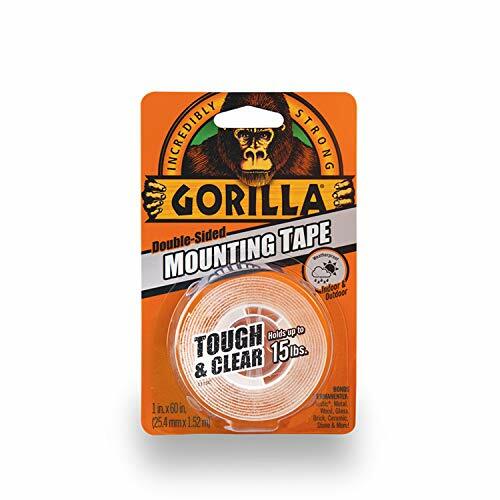 This double-sided tape from Gorilla may surpass your expectations quickly. You can use it on stone, concrete, wood, tile, brick, and other challenging surfaces, and it will stick with minimal hassle. However, the process requires your full concentration. Once you apply the first side, it can be tricky to peel off the back coating to stick the other. You may also want to invest in a pair of industrial scissors to cut through it. One of the standout features of this double-sided tape is its holding capacity. With some material types, it’s capable of holding something weighing 15 pounds in place. That’s an incredible capacity. It’s also clear, doesn’t yellow with age, and is weatherproof. You can use it inside and outside. When you buy this tape, you get to choose from 11 quantity options. If you are working on a large project, buy more than you think you need. The rolls might look big, but they only have 60 inches of tape on each. 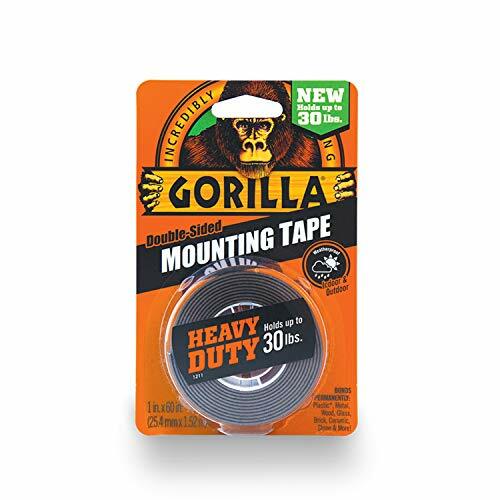 This Gorilla tape is not the best on the market, but given its strength, it’s one of the most desirable products that could solve all your adhesive problems without reaching for glue. 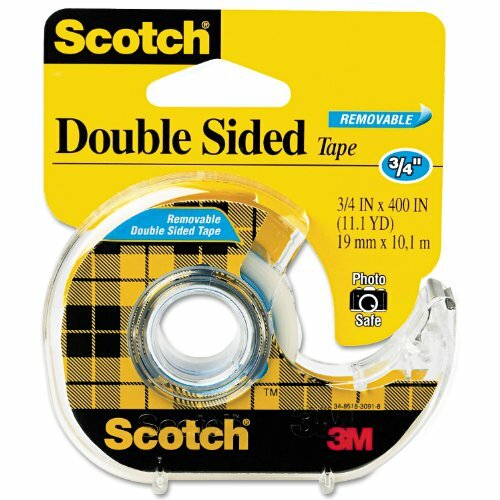 If you pride yourself on being a woodworking master with all the tools of the trade, then make sure you add this double-sided tape from LLP to your toolbox. No woodworking set is complete without it! This 108-foot roll of double-sided tape is precious in the woodworking industry, helping you to mark cuts and lines or stick materials together. You can use it on wood, steel, plastic, concrete, and more. There’s almost nothing to which this tape won’t stick. To use it, you peel the 25mm or 35mm roll, place it on your material, then peel the back layer off. The adhesive is a reliable and long-lasting polyvinyl chloride that won’t let you down. However, even though this tape is stiff and sticky, it’s not permanent. You can remove it with ease, and it won’t leave any residue behind. It might have an expensive price tag per roll, but when you see all this double-sided tape can do, you won’t mind paying the extra money for it. If you need a thin, discrete double-sided tape that will be suitable for almost any applications, then check out the offerings from Jackwood. Whether you’re sticking on a car bumper, putting tiles on your floor, or hanging a photo frame, you may find this tape exceeds your expectations. When you buy it, you choose from four sizing options to suit. Each option has a different width option to hold less or more weight. It’s also acrylic to give it more strength, and weatherproof so that you can use it inside and out. What people also appreciate is broad uses. Not only can you use it on walls and wood, but plastic, steel, bricks, concrete, tiles, and more. 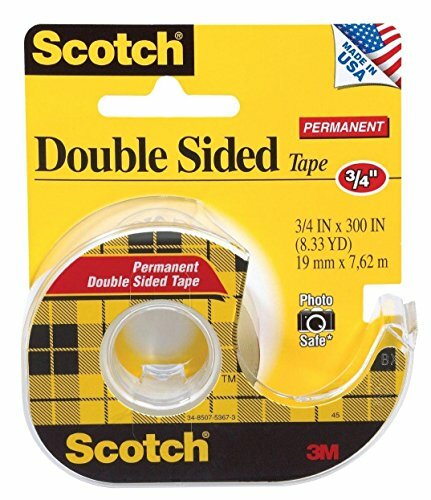 There’s almost nothing to which this double-sided tape won’t stick. Depending on the sizing option, you will also discover it can hold between five and 20 pounds of weight. However, you need to attach the first side for 24 hours before peeling off the back. The bonding requires time to adhere to your surface correctly. Once it’s in place, it doesn’t age. It won’t change color, peel, succumb to dust, or curl up. Air on the tape roll may impact its strength according to some people, but in general, it’s an excellent example of premium and strong double-sided tape. While you wouldn’t use this double-sided tape for concrete as the description says so, you would use it for everything else. When it comes to being a multi-use and incredibly strong tape, this product is leagues ahead of some competition. You can buy it in two-inch widths with 15-yard rolls, and it’s white to blend in with most environments. It’s also a heavy-duty tape with thick adhesive but doesn’t leave behind any residue. You don’t have to worry about cleaning up a mess afterward. 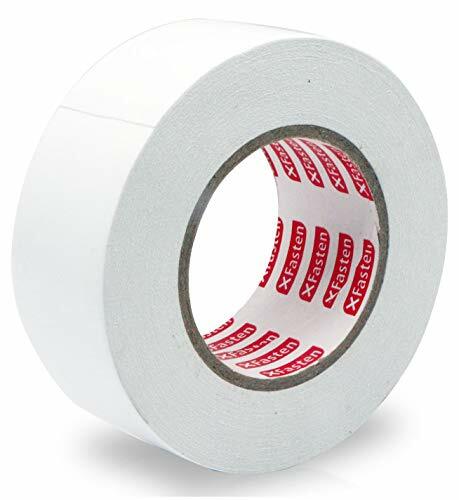 If you need to stick something to brick, tiles, wood, plastic, carpet, leather, or cloth, then this is the tape for the job. It peels effortlessly off the roll, sticks immediately to your surface, then provides immediate strength and durability. Use it for home crafts, DIY, or anything else where conventional adhesives have failed. Don’t reach for the glue when you can try out this double-sided tape from XFasten first. If you’re not on time restrictions and have plenty of time to work on your crafts or projects, then this double-sided tape from Gaffer Power may tick all the boxes for your needs. It’s white, available in 20-yard rolls, is one-inch wide, and is incredibly affordable. Those features alone can have you adding it to your shopping cart. However, there’s more to this double-sided tape than those features alone. This tape is made in the United States, uses DuoStick technology for the best stick, and is a professional grade tape that you can use in the comfort of your home. What’s more, aside from steel, it’s suitable for almost any surface. You can use it to stick down the carpet, rugs, and flooring, or for attaching items to the wall. Don’t use pins or glue on your wall when you can hang posters and signage with Gaffer Power double-sided tape. Once you peel it off the roll and put it on the wall, it has a power-hold seam that keeps everything firmly in place. If that’s not peace of mind, then nothing will be. If there’s one thing that annoys some people, however, it’s the backing side. When you peel the tape off the roll then put it on the wall, you have to apply intense concentration to get the back paper off. It could take a long time, and may even put you on the brink of frustration. As the tape can also come off the surface, it’s a finicky process that could have you need to take a break. Fortunately, once you get that back layer off, you’ll be home and hosed. 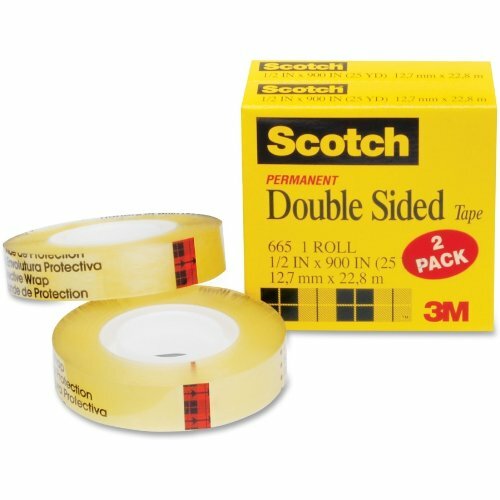 It’s an excellent double-sided tape that will end up being a vital part of your tool or craft kit. You know a particular roll of double-sided tape is going to be a high-quality product when you spend more time peeling off the adhesive layer than you do applying it. There’s no denying the process of cutting and peeling back layers is no easy task, but you will thank the labor component for being as it is when you notice how exceptionally sticky it is. You can use this tape on almost anything. You can choose from five size options with a three-inch width and 25-yard length, and buy the tape in a packet of one. It has a blue adhesive layer and boasts a stretch-free and residue-free finish. That’s not all this tape has going for it either. If you are using it for holding down carpets and rugs, it’s going to impress. It doesn’t leave behind any mess or cause any fuss, but it can stop you from tripping over your rug corners or slipping. If you decide you want to remove the rug or carpet altogether, it doesn’t leave behind any sticky residue. If you don’t want to use this double-sided tape for carpet, then you don’t have to. Stick posters to your walls, signage, picture frames, or something else. Once you get the artwork in place, it will stick well. The entire process is effortless apart from, of course, that backing layer. Put down the glue and instead, opt for this double-sided tape from WOD Tape. It may be the best tape you’ve ever used. 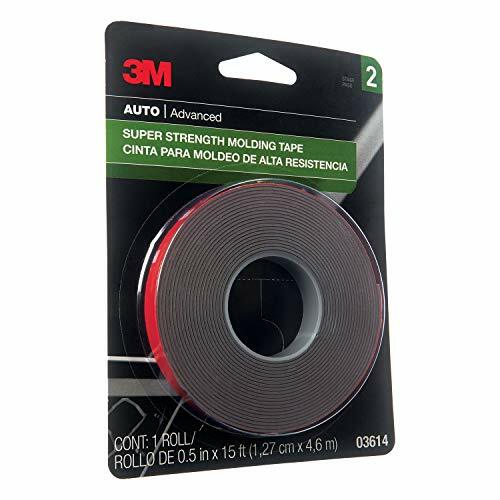 Whether you’re working with car parts, crafts, or anything else around the house, you may like to add this double-sided tape from Odowalker to your toolkit. If you’re not a fan of using glue due to the mess it creates, then this is the tape for you. While it’s as sticky as glue in many cases, it’s an incredible product that may exceed your expectations. You can use it on several different materials like wood, cloth, plastic, and paper, and it will stick in high or low temperatures. It’s tacky, sticky, and has a high initial adhesion rate. Once you attach something to it, there’s little chance it’s going to fall off on its own. This PET acrylic roll is available in six sizes – all of which come in yard lengths of 11. It’s also waterproof so you can use it outside, and is safe for use around your animals and children. If you find it’s not ideal for your application, you’re not stuck with it either. You can return it within a 100-day window thanks to the generosity of the supplier. You may find it’s a challenge to peel the adhesive layer off or stop the entire roll from sticking to surfaces, but those negative points show how sticky and useful this roll is. Not everyone can or wants to use glue for their DIY or crafting needs. However, when it seems like it’s the only option, you end up doing it. That’s why double-sided tape made waves in the crafts and DIY community. Instead of having to use messy, damaging glue, you could use tape. However, the type of tape you require can depend on what you are doing. Before you buy a few rolls to start, pay attention to these points. The best tape for your needs is going to be one that the manufacturer recommends for the material type you are using. Not all double-sided tapes are going to work for your needs. When you check out a product online, read through the list of compatible materials. But don’t take the supplier’s word for it. Read the reviews and find out if it does stick with the content of your choice. All tape measurements are different, with various widths and roll lengths to suit different people. The thickness of specific tape can also mean the roll is smaller, while thicker tape might not suit your application either. Out of all considerations, the roll measurements are as important as the material type. Pay attention to this point. The application environment for your tape is essential. Too hot, and it doesn’t stick. Too cold, and it doesn’t hold either. The supplier dictates what the “too hot” and “too cold” temperatures will be. Read carefully. If you live in hot or cold climes, you may need an extra-strength tape that doesn’t discriminate.